Haven't you tried the new food4Rhino Remote yet? 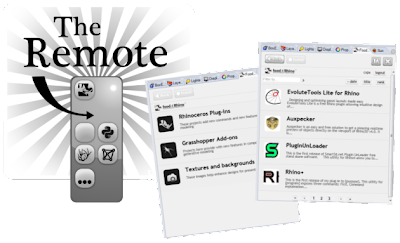 Fully integrated as a panel (Rhino 4 or Rhino 5 32- and 64-bit), the food4Rhino Remote facilitates the search, installation, and management of Rhino plug-ins, Grasshopper add-ons, and textures. Food4Rhino is the new plug-in community service by McNeel & Associates. Find the newest Rhino plug-ins, Grasshopper add-ons, textures, and backgrounds. Add your comments and rate them, discuss new tools, get in contact with the developers of these applications, and—why not?—also share your applications.